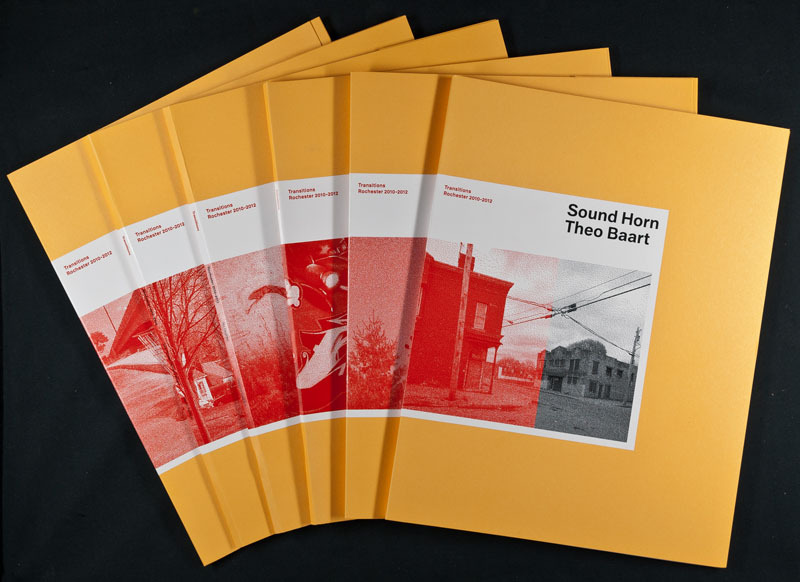 This set of six cahiers was published as part of Transitions-Rochester, 2010-2012. Transitions is an international collaboration looking at the changing city of Rochester, NY (USA), a former company town dealing with urban sprawl, new concepts of city planning, high unemployment rates and poverty. How does a city deal with transition? Urban development in America is often seen as exemplary for coming developments in Europe. The Transitions project is concerned with we can learn from Rochester. Transitions (so far) includes the work of Theo Baart (NL), Jason Bernagozzi (USA), FUA Krew (USA), Gregory Halpern (USA), Cary Markerink (NL), Juliana Muniz (USA) Oscar Palacio (CO), Andrea Stultiens (NL) and Dan Varenka (USA). The project is a collaboration between Visual Studies Workshop and FOTODOK. Partners in the project are the George Eastman House International Museum of Photography and Film and the Rochester Contemporary Art Center.